Athanasius Kircher (1602-1680) was a German Catholic (Jesuit) priest and scholar who worked across the areas of comparative religion, geology, technology, medicine, music, Egyptology and Sinology. The youngest of nine children, Kircher was born in the town of Geisa (central Germany) in either 1601 or 1602 in a pious and scholarly family. He attended the Jesuit College in Fulda and later studied philosophy and theology at Paderborn. He was taught Hebrew by a rabbi as a young boy. Through his twenties, he taught Hebrew, Syriac, ethics, mathematics in the capacities of a teacher and a professor, while gradually developing interests in mechanical devices and Egyptian hieroglyphs. By the time he was in his thirties, he [Kircher] had lived through storms at sea, been washed down a river, escaped the plague, narrowly avoided trampling by horses, even survived an accidental trip through the grinding wheel of a mill. He had also, he said, survived a hernia and gangrene — maladies remedied through ardent prayer. Most foolhardy of all, he had refused to disguise himself in “worldly” clothes while traveling through Germany during the Thirty Years’ War. His Jesuit robes attracted the unwelcome attention of some Protestant soldiers who nearly hanged him from a tree until one of them, moved by his courage, had a change of heart. Ordained to the priesthood in 1628, Kircher spent some time in France in the early 1630s. In 1633, he was summoned to Vienna by the emperor to succeed Johannes Kepler (1571-1630) as Mathematician to the court of the House of Habsburg (the order was later repealed). Kircher eventually landed in Rome and in 1938, began teaching physics, mathematics and languages at the Collegio Romano (founded in 1551 by St. Ignatius of Loyola, the founder of the Jesuits), where he also built a curiosity cabinet called the Kircherianum. After teaching for several years, Kircher decided to devote his time and energy to research. He died in 1680. He body was buried at the Church of the Gesù near Collegio Romano – except his heart, which was laid to rest in Mentorella, an old church outside Rome believed to have been constructed by Constantine, for the restoration of which, in the 1660s, Kircher had raised money. 1631-onwards, Kircher produced a number of books (he wrote in Latin) on a wide variety of subjects. He did not cleanly compartmentalise disciplines (as is the standard today) but used a syncretic approach to knowledge. His first book Ars Magnesia was a study of magnetism. 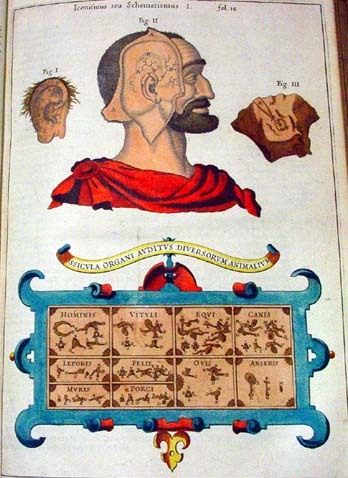 In 1667, Kircher published a treatise called China monumentis, qua sacris qua profanis, nec non variis naturae & artis spectaculis, aliarumque rerum memorabilium argumentis illustrata, simply known “China Illustrata”, in which he mixed fact and fiction regarding Chinese history and culture. However, the book did feature fairly accurate cartography. 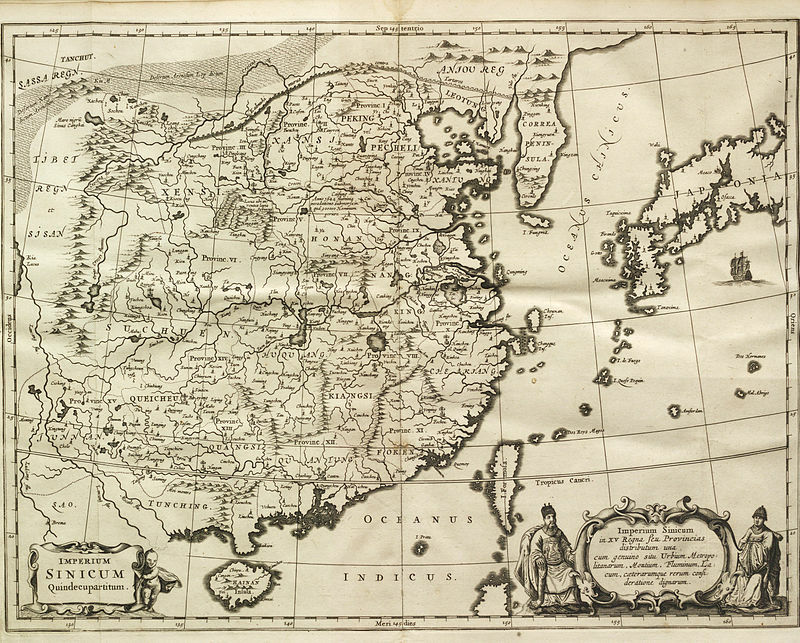 His Mundus Subterraneus of 1665 was a geographical study of the earth. Kircher recorded his views on music in Musurgia Universalis (1650). This book also contains an illustration of human, cow, horse, dog, leopard, cat, rat, pig, sheep and goose ears. 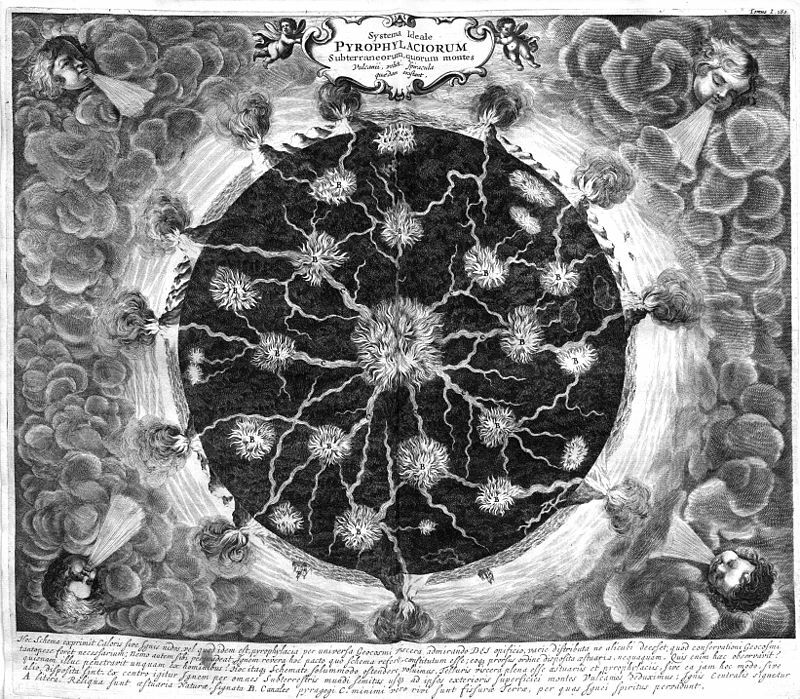 In addition to music theory, Kircher also wrote music of his own. A composition of his called “Tarantella Napoletana, Tono Hypodorico” has been performed by the European early music group L’Arpeggiata [“early music” is a term that covers Medieval (500-1400), Renaissance (1400-1600) and often Baroque (1600-1760) but excludes Classical (1730-1820) Western music]. Tarantella is a rapid dance form originating in southern Italy. Enjoy the melodious piece below! incredible! Thanks for sharing this delightful information. Isn’t he interesting ? 🙂 I learnt about him while reading that book on the Catholic Church by the historian Thomas E. Woods.